Lasting change. When we or our organization pays a coach, the assumption is often that the results that are generated will last, whether or not that is made explicit. For example, we don't want to see that, 6 or 12 months later, all the work put into becoming a better delegator has become meaningless. It is quite possible to function highly in one domain (work, romantic relationship, family, etc.) and less highly in another. I also assume that how "highly" one is functioning is not an innate trait, but something that can change over time. Sometimes, it may not be clear to which whether coaching or psychotherapy would be more helpful. 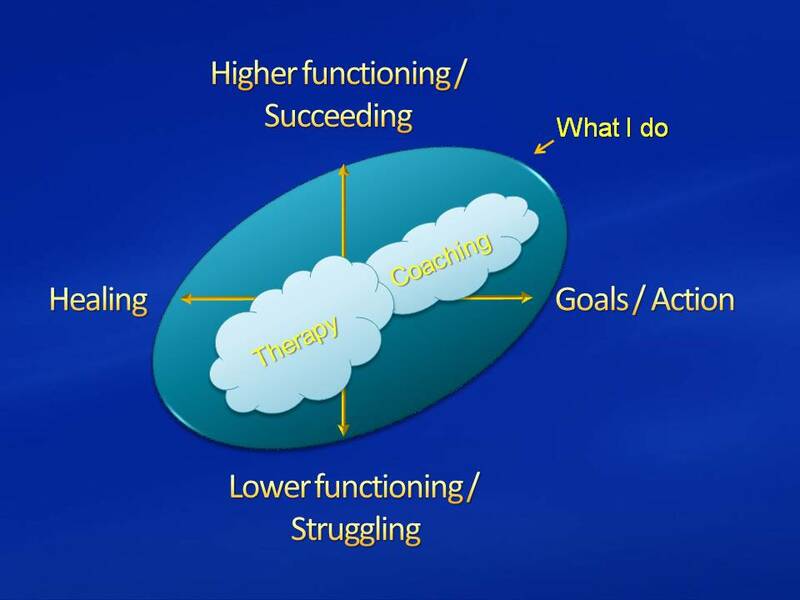 Here are two diagrams explaining how I currently see the relationships between wellness, coaching, and psychotherapy. Coaching & Psychotherapy as we enter 2009 - How far have we come? As we begin 2009, are we any closer to understanding the relationship between coaching and psychotherapy? I believe the short answer is "not much closer". There is not yet consensus about what the process of coaching includes and excludes. Research on psychotherapy process is further along but still continues. As the year progresses, I hope to be able to post some progress on the relationship between these two models of helping people. Read more about Coaching & Psychotherapy as we enter 2009 - How far have we come? By adding coaching to psychotherapy, you can shift or add some focus to moving forward toward concrete goals while continuing to use therapy to heal previous or current hurts. Some clients choose to have different coaches and therapists and while other clients use one coach/therapist. Which is better? Whatever works best for you. By adding psychotherapy to coaching, you can use therapy to focus on healing past and current hurts while continuing to focus on achieving current and future goals during your coaching sessions. Some clients choose to have different therapists and coaches while other clients use one therapist/coach. If you are interested in finding out more about whether therapy or counseling might help you in addition to coaching contact Jonathan Sibley.